Monday, October 1: EVIL DEAD II at 7 p.m. and 10 p.m.
Tuesday, October 2: EVIL DEAD II at 7 p.m. and 10 p.m.
Monday, October 8: HELLRAISER and HELLBOUND: HELLRAISER II double feature at 7 p.m.
Tuesday, October 9: HELLRAISER and HELLBOUND: HELLRAISER II double feature at 7 p.m.
Monday, October 15: RE-ANIMATOR at 7 p.m. and 10 p.m.
Tuesday, October 16: RE-ANIMATOR at 7 p.m. and 10 p.m.
Monday, October 22: Original HILLS HAVE EYES at 7 p.m. and 10 p.m.
Tuesday, October 23: THE CHANGELING and C.H.U.D. 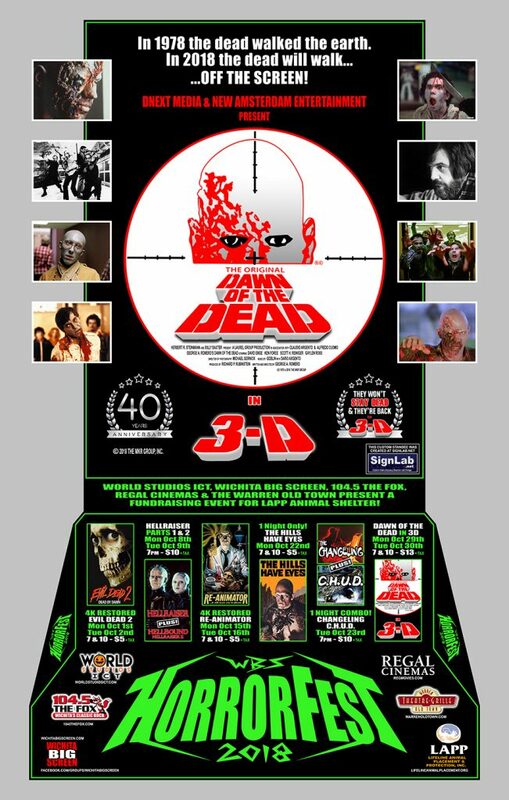 double feature at 7 p.m.
Monday, October 29: Original DAWN OF THE DEAD in 3D at 7 p.m. and 10 p.m.
Tuesday, October 30: Original DAWN OF THE DEAD in 3D at 7 p.m. and 10 p.m.
Bring 3D Dawn of the Dead to Los Angeles. Now! Er, I mean, please.